James Fitzgerald was dreaming up his idea of a zipline tour company. It would be in a native forest full of ancient trees, birds singing everywhere and people laughing, learning and having the time of their lives. But there were a few hurdles – firstly where was this forest? How would we build it? How could we pay for this? And how on earth do you run a zipline company? Above: Nick and Andrew having a break while building the highest platform on the original course in 2012, 22 meters off the ground! 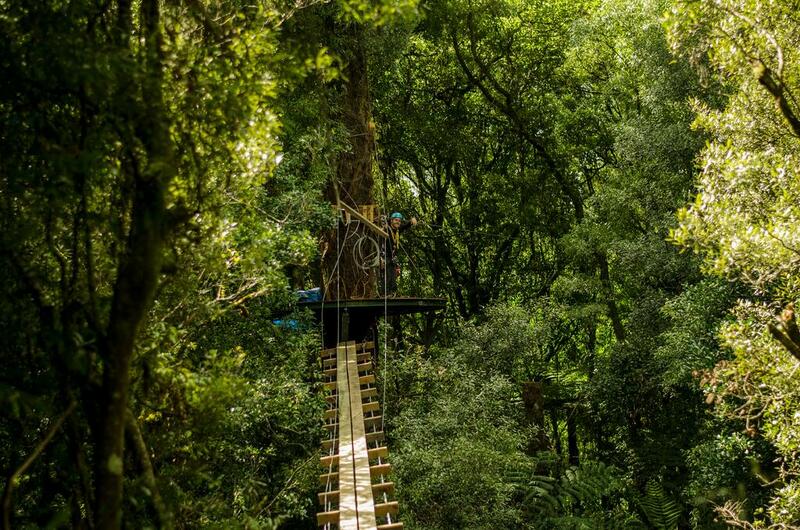 Years went by before the puzzle pieces started falling into place – James found the perfect native forest for zipline tours on the outskirts of Rotorua. He also found someone to share his dream, university mate Andrew Blackford, who happened to be an engineer! Andrew had some great ideas and believed he could design and build James’ system for zipline tours. With a few research trips to zipline tours overseas, James and Andrew learnt that with a bit of trial and error they could also run this company. 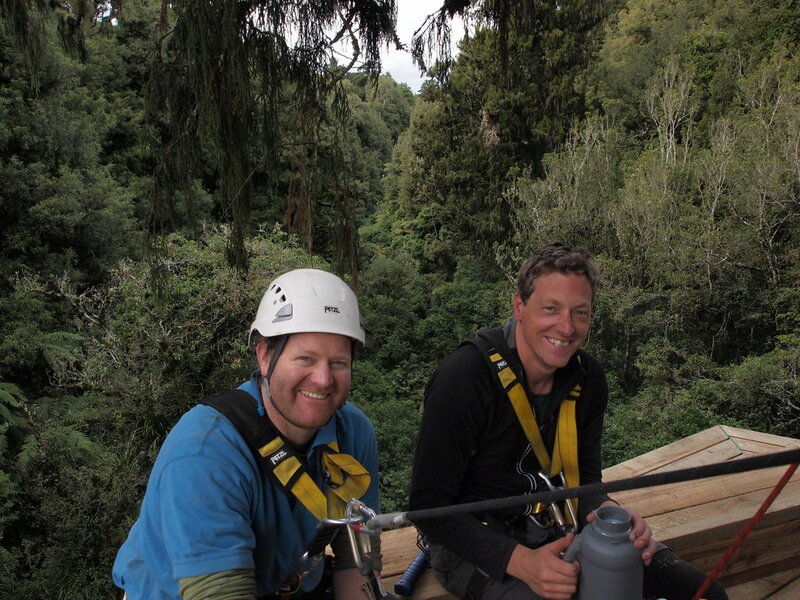 The real work began on 1 March 2012, James and Andrew left their jobs and walked into the Dansey Road Scenic Reserve to build what would become The Original Canopy Tour ziplining course. 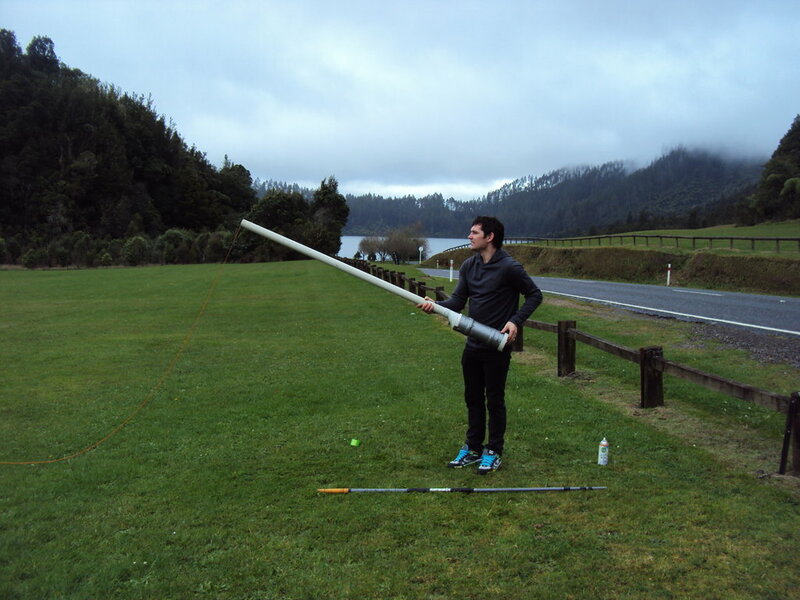 Above: Testing the spud gun before putting it to work in the forest. They discovered very quickly that the secret ingredient to building a course for zipline tours in this forest was a spud gun – that’s how the lines were launched and the heavy duty wire pulled into place. Check out the video here. After 6 months, a bit of luck, some weight loss, arguments and help from family and friends, the zipline tours were ready to begin! These proved hard to come by in the beginning. Charlotte and John from England were our first. James found them brewing soup in their campervan at the Rotorua Lakefront. He knocked on their window and didn't let them go until they agreed to come experience one of our zipline tours. In fact that’s how we found our first few days of customers! Filling the zipline tours was hard work. While it looked cool, people weren’t prepared to take a risk spending a few hundred dollars on something unknown. Slowly we gained momentum, papers started running stories and news channels started playing footage. People started arriving then writing incredible reviews online and we started to grow. Our little team went from 4 to 12 to 25 then 35 all within 3 years. It was awesome to see our zipline tours taking off! Above: Our zipline tours have been departing from our headquarters at 147 Fairy Springs Road since 2015. We started taking on more staff to run more zipline tours, and quickly outgrew our premises in suburban Rotorua. 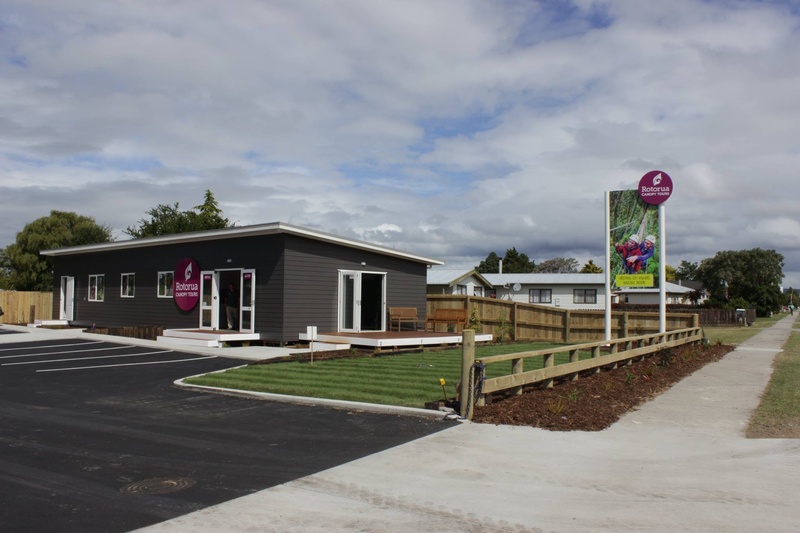 We bought some land and developed purpose built headquarters near the Northern entrance of Rotorua (closer to the forest). With the amount of customers coming through we could then start our conservation dream but that’s a different story in itself. Check out the conservation project here to keep up with our conservation updates. And that brings us to today, Rotorua Canopy Tours is 6 years old and is now well and truly entrenched as an exciting and educational adventure for visitors to Rotorua! It's a unique twist on zipline tours and we couldn't be more proud of how far it's come. In July 2018 we launched our new tour - The Ultimate Canopy Tour! A selected group of Rotorua Canopy Tour guides, along with the guidance of our engineer genius, Andrew Blackford and guide Scott built the course over a 6 month period. Together they produced a longer, faster and more spectacular course than the Original Canopy Tour. If you have been on our Original Canopy Tour before then now it's your chance to come back and create some more memories with us and give the Ultimate Canopy Tour a go! We still have heaps of plans for the future of Rotorua Canopy Tours such as opening up walking tracks in part of the forest for the public. Watch this space as there is so much more that will be happening over the next few years!